Semert Desta is a 6 year old girl from Addis Ababa. 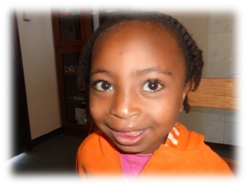 Her lip was repaired at a different clinic, however, her palate was repaired at Yekatit 12 and she is now attending speech therapy sessions. Firehiwot Bekle is an 18 year old from Addis Ababa. Her palatoplasty was done at Yekatit 12 hospital. She is now attending speech therapy.